So we’re gonna do this just like we did this last year, and I’m mostly rewriting last year’s post word-for-word. This time of the year is, among other things, nomination season for the Hugo Awards, and general tradition in SF/F circles is for people to post the list of eligible things they’ve been involved with. For me, this year the only thing that I have that’s eligible is actually this blog in the fan writer category. Meanwhile, although tomorrow is the deadline for acquiring a World Con membership in order to nominate and vote this year, I still have a month to read a ton of stuff and figure out what I’m going to nominate, so please link me to you eligible titles (or recommended titles from others) so I can get started on that process. Other than your awesome, I’m particularly interested in your various short-form recs, as I don’t read enough short stories in general, and it’s a pretty neat genre that highlights the beauty of good structure. We do not give short stories enough love. So, if you have stuff, please post in comments with links; meanwhile, please go browse the comments which will hopefully be flowing in shortly and check out anything that so moves you. I’ll post the schedule of programming I’ll be participating in once I have it (as well as the book’s release date or pre-order info, which is also in that Real Soon Now category). If you’ll be at the con and spend time in my little corner of the Internet, please do come say hello! 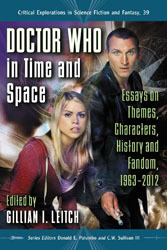 Author Racheline MaltesePosted on October 22, 2012 Categories acafen, books, tvTags entertainment, tv, whoniverseLeave a comment on Calling all Toronto-area Whovians! In many ways, I am the worst possible person to review Chris Colfer’s The Land of Stories. Not only am I not a middle grade reader, I often loathed books appropriate for my age group even as a child because I felt they were too overt in the lessons they were trying to impart and the narrative tricks they were engaging in to do so. “Oh look, another book about some girl who communes with wolves that will teach me about the importance of self-reliance, algebra, and offering loving respect to my parents,” I would start monologuing each May when faced with my annual the summer reading list requirements. That stuff made me bitter. I can’t tell you that Colfer’s book necessarily avoids content that stirs that reaction in me, but I also can’t tell you it should. After all, not only was I cantankerous about these sorts of books as a child, I am certainly not a middle grade reader now, nor am I the parent of one. But, aside from the necessary content and structural oddities of book designed for this age group, there’s a ridiculous amount of interest in The Land of Stories. Some of it, such as the sure to be endlessly quoted “unicorns don’t have rabies” discussion, is mostly just hilarious, even if I can’t help but link the discussion of one-horned magical creatures and disease to the use of “unicorn” as a way of discussing Kurt Hummel’s queerness on Glee and finding a witty, and unfortunately necessary, indignance in the remark. A sadness came to Cinderella’s face. “I never thought my life would change so drastically, so I always made the most of what I had,” Cinderella said. The actual passage is several times the length of what is quoted above, and is not necessarily even the book’s most startling moment. In fact, each interaction with the queens of the storybook world can arguably be read on two levels, one of which is fixed outside of the narrative of the novel. In case you’re curious, the kings Charming (they’re brothers) fare less well as attractive and largely interchangeable cardboard cutouts. “Every driven person comes from a mountain of pain they wish to keep hidden,” the Evil Queen said. Certainly there is something sly and uncomfortable about the queens of a series of storybook kingdoms serving as the clearest representation of the authorial voice, when that author is the one in question. If this is intentional on Colfer’s part, it’s a delightful and pointed play on expectation and underscores the allegorical queerness in a book that isn’t really queer at all (except perhaps when Conner tells us he really, really can’t let the guys at school find out about his newly discovered ancestry). And, if it is unintentional on Colfer’s part, the reader response to it makes for a no less compelling conversation. It’s statements like Evil Queen’s on ambition, however, that also make the book interesting regardless of authorship. Among other things, I wonder what it would be like to read that sentence as an eight-year-old. What does that sentiment — which rings very true to me — impart to a person of that age? It doesn’t seem like all those boring lessons about wolves and algebra and loving my mother at all. Where The Land of Stories excels as literature is in the voices and dilemmas of its adults. Colfer’s ability to juggle multiple narrative voices is interesting, and I probably shouldn’t be surprised that as an actor he clearly has the most fun with the parts of the narration that come to us in the first person. Much like Struck by Lightning, Colfer’s freshman film effort that I believe will be in general release soon, the adult stories which we see in passing through the eyes of children with bigger concerns linger because Colfer suffuses the adult relationships with loss and longing, knowing that in his fairytale book the ending everyone craves — happily ever after — is innately boring. Ultimately, while I am reasonably sure that The Land of Stories is a clever, competent, and viciously funny middle grade book that will be deeply pleasing particularly to children who feel peculiar because of how their intelligence manifests, The Land of Stories impressed me for the way in which it emphasizes and exemplifies the infinite nature of story telling: A young man who is living what some would call a fairytale writes a novel about two children who fall into a fairytale and then navigate that world through the journals and stories of others, while the reader, upon noticing these layers of narrative, unavoidably also extends the story in ways that were, if not surely unintended then are, at least, intentionally unacknowledged. If nothing else The Land of Stories is a unique entry in the annals of transformative work as the narrative performs multiple functions and extends multiple stories for several, often disparate audiences, simultaneously.